An action-packed weekend of cricket has seen the Tigers walk away with some favourable results as the final march to the Christmas break begins. First grade won a high scoring affair on Peter Burge Oval against Sunshine Coast. The visitors piled on 348 batting first but took just 3 wickets as Redlands romped to victory during the final hour of play. 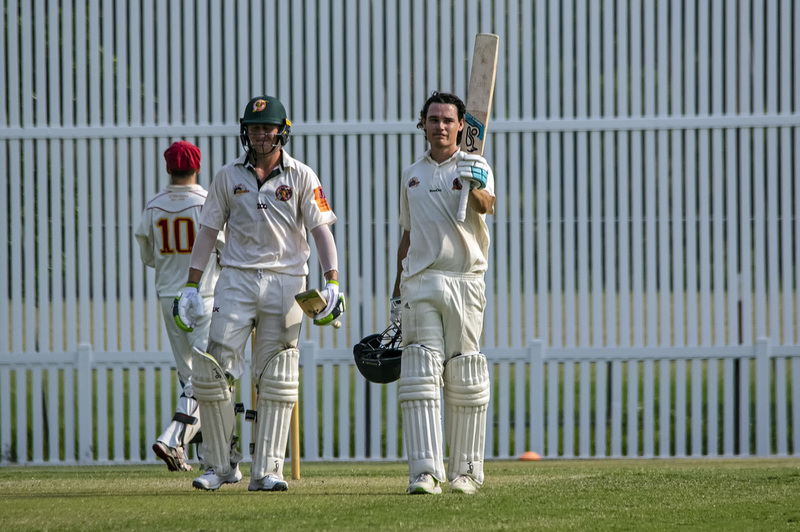 The match signalled the return to Tigerland for Marnus Labuschagne and Sam Heazlett who set Peter Burge Oval alight with innings of 182* and 131 respectively. Labuschagne also took 5/62 with the ball to cap off a fantastic match. Second grade went down to the same opposition away from home. The Tigers won the toss and elected to bat first but were unable to defend their first innings total of 260. A partnership between Jason Grosvenor (60) and Cameron French (55) got the Tigers’ batting innings back on track after a rocky start which saw them lose 3 wickets for 15 runs. Stuey Edgar (48) and Jamie Ryan (36) also contributed important runs as wickets fell around them. Unfortunately for Redlands these performances went in vain, with the home side surpassing their total seven wickets down shortly after tea on day two. Fifth grade failed to defend 163 on the road against University of Queensland. The home side chased the runs nine wickets down in another close fought affair. Damyn Waddups and Michael Moss top scored for Redlands with 49 and 36 respectively. The stars of the day with the bat were Matt Fay (77), Sam Geyer (32) and Greg Morton (30). With the ball, Keshavkeerthi Chandrasekaran bowled his side to victory with 3/12 from his eight over spell. Sixth grade three earned a highly convincing victory against Nundah United in their first game in a higher grade. The Tigers batted first and piled on 164 before dismissing the opposition for just 84. The Jodie Fields Shield side travelled to South Brisbane’s grounds for another round of twenty-twenty matches on Sunday. The Tigers restricted Sunshine Coast to 137 in the opening game but were dismissed for 98 in reply. Their batting innings wasn’t without highlights though. Delyse Laycock raced to 29 from 13 deliveries while Jesica Pang also made a quick-fire 30 to put the Tigers in the hunt. The second game of the afternoon saw Redlands return to winning ways against Valley. The Tigers successfully chased the 108 runs required for victory thanks to the efforts of Jesica Pang (59*) and Clodagh Ryall (28*). Jess Sanders topped the wicket takers column with 3/19.